Big decisions are really difficult to make. For me, the decision to close the doors on Boston Handmade was even more challenging than most because this group has become a core part of my life during the past eight years. Through much ebb and flow, with group members coming and going, the needs of the overall membership changed, and so the shape and form of the group also changed along with those needs. The climate for micro-businesses and professional makers has improved so radically in the past eight years that the demand for our programming has become less urgent. There are now many in-person and on-line groups to become a part of, there are endless craft fairs to participate in, there is a wide variety of books, webinars, podcasts, and workshops to assist creative professionals in every way they can imagine. It's our hope that departing the party helps put additional light on other efforts of the new handmade movement, which is good for everyone. 2007. 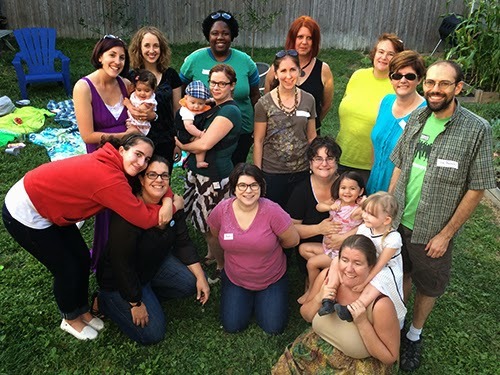 The first meet-up of what would quickly grow into Boston Handmade. In 2006 a photographer friend told me about a new website called Etsy.com that was created specifically for artists and craftspeople to sell their original work through the internet. I couldn't imagine anyone would buy anything handmade from the internet, but I decided to check it out, saw that it was legitimate, and quickly opened my own shop. One of the features of this new website was a set of online forums for sellers. I had no previous experience with online discussion forums and wondered if I could find anyone else in Boston selling their work on Etsy. I posted an open invitation for Boston area Etsy sellers to come to my studio for networking, to share ideas for selling online, and to join forces in some way, because IMO the power of many is a great thing. The energy was so strong that day, and the enthusiasm so palpable, Boston Handmade was born. 2008. 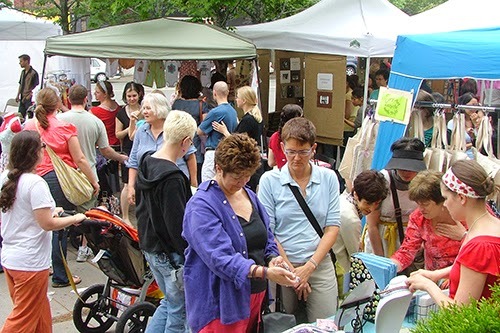 The first Boston Handmade Marketplace in Union Square Somerville, part of the Somerville Arts Council's ArtsUnion series. The Marketplace was an annual event for Boston Handmade every July through 2014 with 28-35 exhibitors each year. As you may remember, the landscape for sales, communication, and community for artists hand-crafting their work in small studios was vastly different in 2007 than it is today. Email marketing was just catching on, most people I knew did not have professional blogs, Twitter had just debuted, there was no Instagram nor Pinterest, and people were still actively using MySpace. It was also a time before the big DIY craze and there were no weekly craft marketplaces for creative micro-businesses to sell their handmade goods. Eight years ago Boston only had two well known annual craft shows and many of Boston's Open Studios events did not have group exhibition spaces. One of the first things Boston Handmade accomplished as a group was to organize a one-night craft show in my South End Studio. This type of event was almost unheard of at this time, and it was empowering to come together to organize as a group. After the success of this first event we produced many, many shows together including a monthly Artisan Fair from 2007-2012, May through September, as part of the Jamaica Plain First Thursdays (thanks to JP Centre/South Main Streets), an annual July Marketplace in Somerville from 2008-2014 (thanks to the Somerville Arts Council), several Valentine shows held in restaurants and vacant store fronts throughout greater Boston, trunk shows all over the place, "shows within shows" at various open studios and holiday shows here, there, and everywhere. 2009. In this inaugural year of the SoWa Open Market Boston Handmade was invited as a special guest and given a whole row of exhibitor booths at the front of the outdoor space at no charge. Boston Handmade Members exhibiting and pictured here from the top left in rows: Brooke Pickering from Bancroft Studios, Amy Keller from Bumblebelly Designs, Louise Cady Fernandes from The Hole Thing, Linda Branch Dunn, Nancy Weller, Beth Brennick, Marla Kunselman, Mimi Kirchner, Tony of Chroma Lab, Betsy Baker of Stonehouse Studio, Jen Tang of MaJenta Designs, Jessica Burko, Jennifer Stark of Blue Alvarez, Nicole Grasso-Correnti of 83 West, Allison Fraske of Fraske Designs, Lucie of Lucie Wicker Photography, Crystal of Vintage by Crystal, Alicia of Chroma Lab, Kerry of Kerry Hawkins Photography. Creating our own exhibition opportunities has always been a big part of Boston Handmade because an amazing thing happens when artists come together to create community. There's a strength and a bond and a support system that we don't have as individuals working in isolated studios. Whether exhibiting together, teaching one another skills of our crafts, we supported each other as we developed our businesses, struggled through growing pains and celebrated the many successes of every group member. This is what has made our unique collective strong over the years. 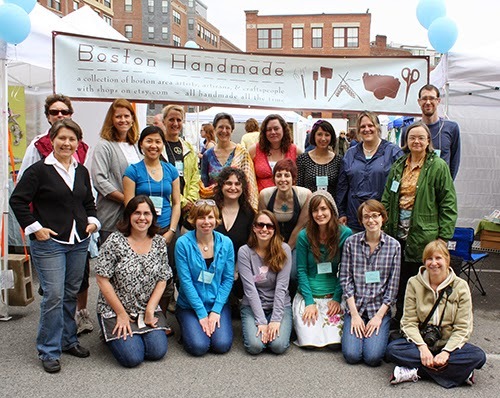 This type of community was new to most of us when Boston Handmade began. 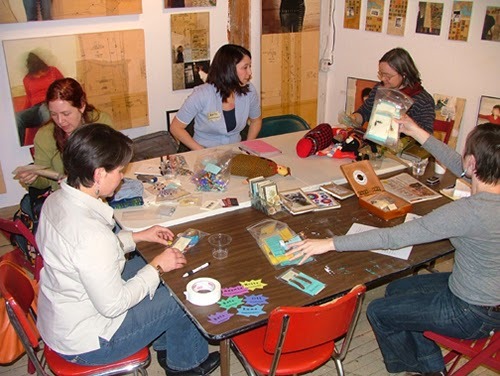 For most of us, as professional artists and crafters we didn't get together that often, there were no stitch salons nor creative shared work spaces where we could meet. So we had monthly meet-ups in our homes and workspaces. We met to learn and to teach. We bonded in so many ways, and though this group will not continue, our bonds will not be broken. 2010. Our third and final Boston Handmade Holiday Gallery in Downtown Crossing. Our gallery was produced in this location for three years and then in 2012 at Cristina Hurley Gallery, and in 2013 in Brookline Village. 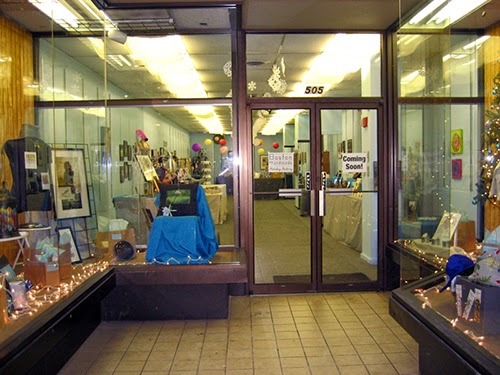 Each year we exhibited work from approximately 30 local artists and craftspeople. I'm sharing this history of Boston Handmade because at the time our group first began there was a visceral longing for connection. We wanted to claim our roles as practicing artists in the creative economy, and find ways to successfully reach new audiences for selling our work. Our group and all of our efforts to create visibility for the resurgence of the handmade movement was filling a much needed void for us as individuals and for the wider Boston-area creative community. We blogged, we promoted each other, we announced each member's activities to our growing numbers of fans and followers, and we were rewarded for our efforts with press coverage and wonderful outreach opportunities. We built the community what we longed for, we thrived in our new found companionship. 2011. 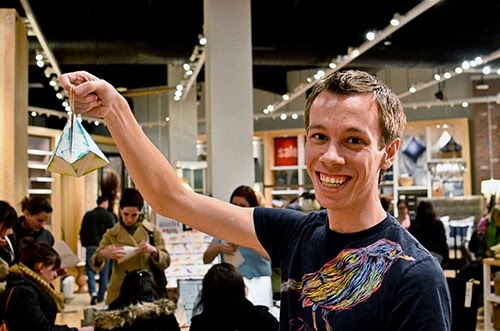 Etsy.com partnered with West Elm to produce a series of craft nights at their retail stores around the country and Boston Handmade was invited to run activities at the Boston Fenway store. Pictured here, ceramic artist Arthur Halvorsen. Photo credit: Kerry Hawkins Photography. Many of the amazing things to happen for us during the past eight years were the result of developing connections with other businesses and organizations. Our members first found each other through Etsy.com but as a group we were not immediately affiliated with Etsy. In 2008 we had made enough positive noise that an Etsy administrator visited us in Boston to talk in-person about our becoming, what was then called, an Etsy Street Team. We signed on and enjoyed a warm relationship with Etsy HQ. We remain so grateful to Etsy for all their support over the years including making the introductions for us to West Elm and Whole Foods, both of which welcomed us into their stores for special craft events. 2012. 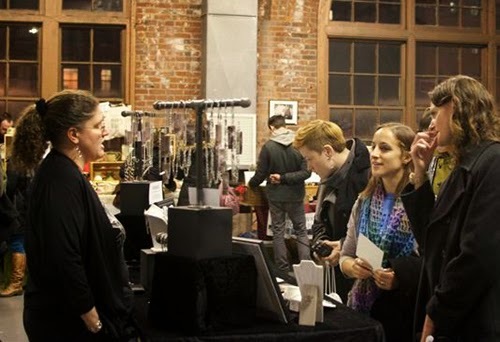 Each year from 2009 to 2012 Boston Handmade was invited by the organizers of the Bazaar Bizarre to participate in their annual winter event as a group. We had our own room at the Cyclorama to set up our show and choose our own exhibitors. It was an honor and a thrill to participate. Pictured on the left, Liz Stewart of Lush Beads. Photo credit: Kerry Hawkins Photography. In addition to several larger businesses that lent us a helping hand and increased our visibility, there were also many (many, many, many) local groups and countless individuals to whom we owe gratitude. I can't begin to list everyone here, for if I do, this post will never go live. The list is long, you know who you are, and for all of your support, I offer sincere thanks and a great big hug. If you're curious about our eight years worth of collaborators take a stroll through the blog archives. There's a lot to discover in the 2,092 blog posts written by members of Boston Handmade. Everyone we worked with, everyone who was ever a member of Boston Handmade, every property owner that lent us a pop-up space, every blogger that wrote about our members, our 4500+ Twitter followers, 1700+ Facebook fans, everyone attending our events and purchasing our work, you urged us on and stoked our fire to thrive. 2013. Prompted by my love of using recyclable materials in my own art, and a craft project I led in my son's preschool class, I organized a Boston Handmade day of earth friendly craft that was free and open to the public. 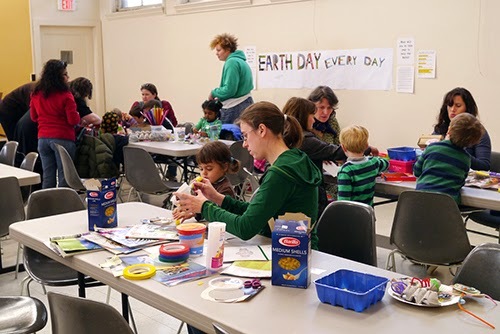 The event was aptly held on Earth Day and hosted by the Jamaica Plain Branch of the Boston Public Library. Approximately 200 people attended throughout the day. Photo credit: Bev of Linkouture. It's my intention to keep this website online as a resource and a research tool. We have lots of great business tips to share, talented makers to introduce, and how-to articles to pass along. 2014. The annual BH BBQ was a much anticipated event each year. It was an event to celebrate, gather with no networking nor educational agenda, and a chance for us bring all of our family members together for an afternoon of fun, food, and cheer. Pictured here from the top left, down to the 3 in the middle, then the 3 in front: Bev of Linkouture with daughter Eve, Laurie Lynn of Beryllina, Diane Ivey of Lady Dye Yarns, Susanne Guirakhoo of Enchanted Hue, Sharon Fischer of Stray Notions, Jill J. Burns of Early Bird Designs, Jon Barrows, Lida Brooke of Lida Brooke Designs with son Max, Dana of The Patterned Peacock, Jessica Burko with daughter Naomi, Cristina Hurley with daughter Dana, Abby of Abigail Leigh Handbags, Lynn of Prunella's Workshop with daughter Keira. Creative communities have developed in pockets throughout the Commonwealth, exhibition opportunities abound, and the 21st Century handmade movement has swept the country! During this time of great positive change for all makers, Boston Handmade remains full of warmth and spark, though all good things must come to an end as a wise woman once said to me, "Not everything has to last forever." and I truly believe she was right. Boston Handmade rose out of a great need, and the wonderful news is there are many other outlets in 2014 to fill our shoes. We've come a long way together, we've seen each other grow, we've accomplished so much, and now it's time to say goodbye. However, there is a silver lining to this news: the current members of Boston Handmade are in the process of creating a new group to meet the new needs of artists, craftspeople, artisans, and designers. Fostering continued growth and working together to provide support for reaching creative professional goals will go on. This post will be updated with the new group information once it's available, and we'll spread the word to all of you once there are details to share. To all the people I have known because of Boston Handmade, for all the wonders I've seen, all the knowledge gained, all of the life we have lived together, I say thank you from the bottom of my heart and I look forward to seeing you down the road. Awww.... I looked forward to your emails every month as a great source of local opportunities. Thanks so much for all of your efforts.